Poole Harbour Watch and Dorset Police and Crime Commissioner, Martyn Underhill, supported the launch of a new South West Portwatch scheme on 12 December. 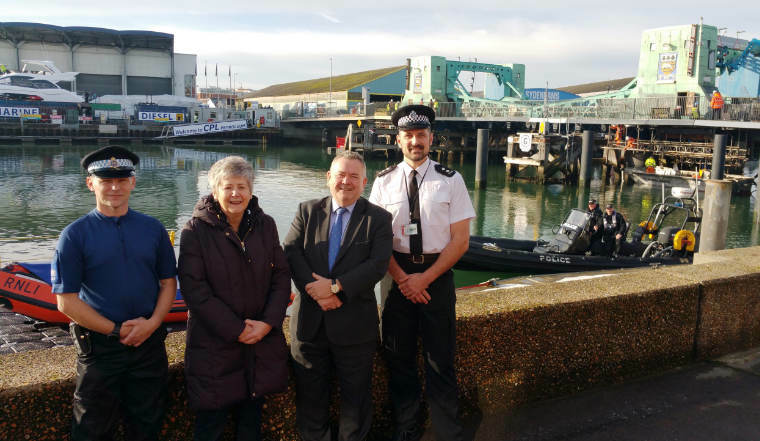 Launched on 12 December at the Dorset Police Marine Unit in Poole, a new South West Portwatch scheme was supported on the day by PCC Martyn Underhill and Poole Harbour Watch. The scheme has been rolled out across the strategic alliance, aiming to tackle the specific and unique challenges faced by marine communities. It consists of a secure website and a phone application which sends push notifications out to members. “Portwatch is a two-way regional messaging system that allows the police, partners and marine communities to share intelligence and manage threat, risk and harm more efficiently,” said Inspector Derek McKerl of the Alliance Operations Department. It allows members to report marine or ports related crime directly to those working in this specialised area, reducing demand on control rooms. “Via a mobile app, officers are able to share information across the three counties without the need to return to the station. This ensures we are able to act on any suspicious activity quickly to keep our communities safe. I encourage local businesses operating in and out of the marine environment to sign up,” McKerl continued. As part of the drive to increase the number of businesses involved in the scheme, a number of licences have been made available, which provide for two years of free membership. The tools and resources available on the online platform allow for announcements to be sent direct to members’ mobile phones or inboxes. It also has the capability to create chat rooms. PCC Martyn Underhill said: “Since I began campaigning on the issue of port security back in 2015, things are beginning to move in the right direction with more freight searches taking place locally and a closer working relationship between Dorset Police and Border Force, but we cannot be complacent.